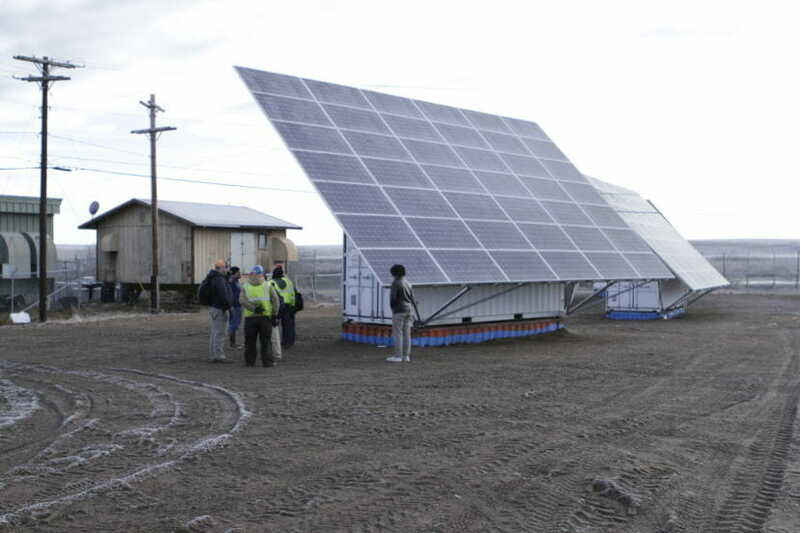 Buckland’s project is part of a regional push toward renewable energy and it’s financially supported by NANA — Northwest Alaska’s Native corporation — as well as the U.S. Department of Energy. Those backers are eager to see more, similar projects, according to Sonny Adams, NANA’s director of energy. Adams flew to Buckland last week to see the brand new solar arrays, along with a group that included a Department of Energy official, a renewable power consultant and a reporter. 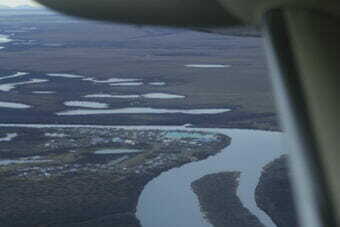 Buckland, with about 400 residents, is 75 miles from Northwest Alaska’s regional hub, Kotzebue, and it can only be reached by boat or bush plane. Like the other villages scattered across Northwest Alaska, Buckland produces its own power with diesel-fueled generators. A state subsidy program, Power Cost Equalization, helps reduce residential electric bills, but only up to a point. If you use more than 500 kilowatt hours in a month – a little more than half of the average residential power bill nationally — you have to pay full price. In Buckland, that’s 47 cents per kilowatt hour, according to state data, compared to 19 cents in Anchorage and a national average of 13 cents. Prices are even higher elsewhere in Northwest Alaska. Buckland sits on a river and can have its diesel floated in on a barge, but other villages, like Noatak, sometimes have to fly in their fuel. Adams’ group arrived in Buckland on a frosty morning last week. 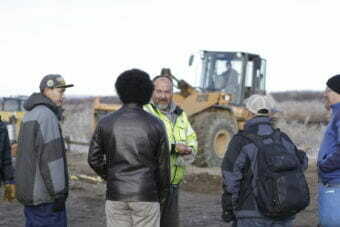 Weber, the water plant operator, met the visitors at the village’s dirt runway and walked them to the site of the new power project. Buckland’s three solar arrays were installed this fall, though they haven’t been switched on yet. The equipment came from BoxPower, a California company that sells complete solar power stations that fit inside a shipping container. At the site, Adams and the rest of the visitors examined the low-tech foundations that the project’s architects designed for the shipping containers: They sit atop three other shipping containers that were buried in the ground and filled up with dirt. 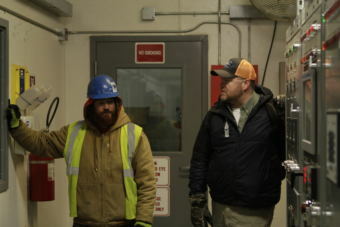 They also discussed a glitch with pumps connected to Buckland’s wastewater system that’s causing the village’s wind turbines to stop working. “There’s a lot to it that’s just beyond the obvious, what you can see. And villages, in general, have unique power systems,” said Brian Hirsch, a consultant who’s helping with the renewable project. Afterward, the visitors went in search of the mayor, Tim Gavin Jr. They found him with a crew of men demolishing a burned-out church, then headed toward City Hall as Gavin puffed on a Marlboro. Inside, over donuts – a hot commodity in a village with just a few tiny stores — the group discussed what will happen once the village’s new solar panels and batteries are turned on. Gavin wondered about a special price tied to the renewable power. Those details still need to be worked out. 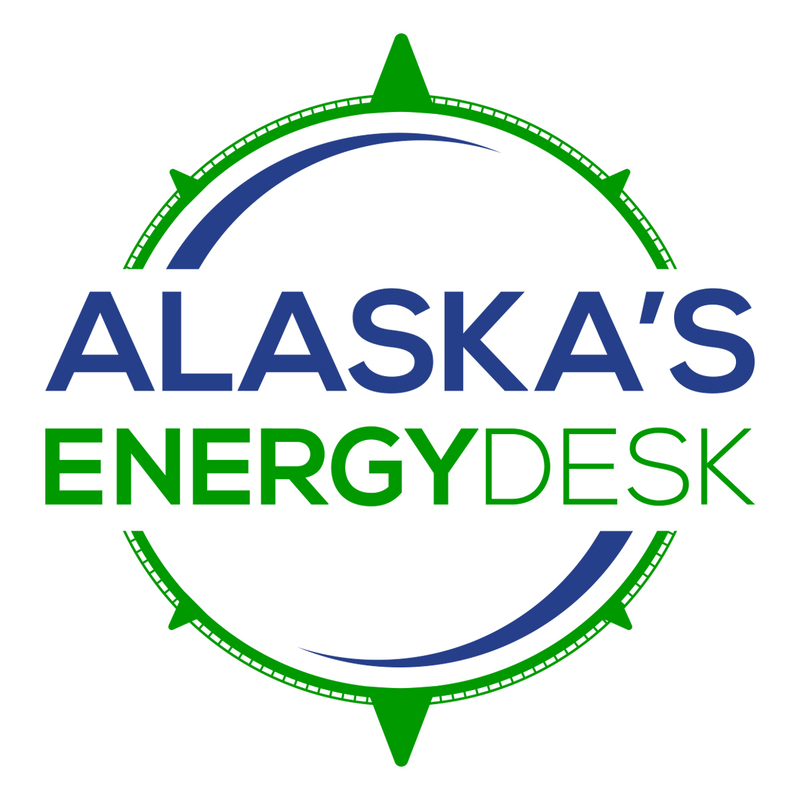 And Adams, in an interview, said he wants to be careful about people’s expectations for renewable power, in Buckland and elsewhere in Northwest Alaska. It’s probably not going to slash electric prices overnight, he said. Instead he wants to protect villages against spikes in the price of diesel and heating fuel. On their way back to the airport, the visitors stopped by the offices of Buckland’s tribal council, where a woman complained about a recent monthly electric bill of $1,100. Others told similar stories the next day at a regional energy planning meeting in the hub town of Kotzebue. Billy Lee, a tribal leader from the village of Shungnak, said he used to spend $5,000 a year on home heating fuel, which costs $8.25 a gallon. But recently the Northwest Arctic Borough, as part of a test project, installed something in Lee’s house called a heat pump, which runs on electricity instead of fuel. It saves him $2,000 a year, he said. Adams’ long-term vision is pushing Northwest Alaska residents toward heat pumps that run on locally-produced renewable power, rather than relying on an expensive, imported commodity – fuel – for electricity and heat. But there are still a lot of hurdles standing in the way of expansion of solar and wind power, and batteries, beyond Buckland to Shungnak and the region’s nine other villages. First, the new technologies are expensive. A big chunk of the money for Buckland’s renewable system came from grants, and Adams said it’s probably not realistic to expect the same kind of cash to materialize for more villages. Second, it’s more straightforward to install the renewables in Buckland because the city runs its own utility. Most of the region’s other villages belong to a big rural utility, Alaska Village Electric Cooperative, that serves dozens of other communities. Third, the structure of the state’s electricity subsidy program means that rural residents may not see much savings from reduced diesel use that stems from renewable power projects. That’s because the subsidy program pays part of the diesel’s cost — meaning that less consumption will likely result in lower state spending, and only a small reduction in costs to residential customers who keep their use below 500 kilowatt hours. Proponents of renewable energy say that dynamic discourages utilities from investing in new power projects. For now, the aim in Buckland is simply to show that the concept will work, Adams said.